Wine-pages’ columnist Dr Caroline Gilby has a PhD in plant science and became a Master of Wine in 1992. With a special interest in viticultureand wine science, she is also on the board of the Journal of Wine Research and contributes to the Oxford Companion to Wine, Decanter, Drinks International and many other publications. In this essay Caroline looks at biodynamic farming, trying to separate science from ‘belief’, and examining the veracity of claims made by proponents of biodynamic farming. Whilst passionate about responsible and sustainable agriculture, her conclusions on biodynamics cast doubt over many of its basic tenets and philosophies. Recently I received an invitation to a wine tasting specially planned for a so-called ‘fruit’ day, linked to the biodynamic calendar. Even major retailers like Tesco and Marks & Spencer are reported to choose the date of their press tastings to coincide with these ‘fruit’ days when their wines are meant to show best. This strikes me as wrong in so many ways. After all, even if there was anything in it, surely you want to show that your wines are good on their worst days, as that may well be when your customers are drinking them. The idea that we can only enjoy wine properly on certain days seems very short sighted in an industry already under pressure. I honestly can’t see many drinkers consulting their biodynamic diary before broaching a bottle, and then deciding not to drink because it’s a root or node day. In the UK now there seems to be an almost sanctimonious reverence for biodynamic wines, and few wine writers seem prepared to stand up and challenge these practices. I’d like to give readers of wine-pages a chance to see a little of the rational side of the argument, and to make up their own minds about the merits of various approaches to growing grapes. The starting point for biodynamic viticulture is to farm organically, and then add on various philosophical and spiritual ideas based on philosopher Rudolf Steiner’s teaching from the 1920s. He invented a spiritual philosophy he called ‘anthrosophy’ based on the idea of protecting (unproven) life forces and cosmic influences. As part of this, a farm is seen to be a kind of unified super organism that should be self-contained. Today there are a number of highly regarded producers who have gone biodynamic, including some of the world’s great wine names, so it’s certainly worth looking at what has attracted them. In Burgundy these include Romanée-Conti, Lafon, Leflaive; in the Rhône Chapoutier is notable and in Alsace there’s Zind Humbrecht among others. The new world has biodynamic producers too, such as the Sadie family in South Africa, and Milton Estate and Felton Road in New Zealand to name just a few. Demeter is the biggest certifying organisation world wide, and it is interesting to note that they have registered ‘Biodynamic’ as a trade mark in some markets, notably the USA, suggesting to me that it’s more marketing tool than genuine philosophy. As a starting point, it’s worth a detailed look at their web site. In amongst all the philosophy and pseudo-science, there are actually some very sensible pragmatic approaches to ensuring healthy soil and vines with balanced canopies. For instance, fertilisers can only be natural manures and compost, ideally produced by animals kept on the farm. There’s a strict limit on how much nitrogen can be added in this way, and the limits definitely will control vigour, while adding organic material to the soil. Rock dusts including phosphates and lime are allowed too as they are derived from nature. Incidentally, powered sulphur and copper based treatments such as Bordeaux mixture are permitted on this basis too – even though copper is well known to build up in the soil and cause problems such as killing earthworms. Cover crops are essential and these should be diverse to encourage better soil health, less compaction and beneficial insects. This all sounds like good responsible farming practice so far – along with very careful attention to detail and observation in the vineyards to spot problems before they spread. It’s after this that I start to have problems, but sadly I’m yet to meet a biodynamic producer who will allow that it may be possible to pick and choose the scientifically rational bits. Instead, they all insist on ‘belief”‘ in the whole approach. 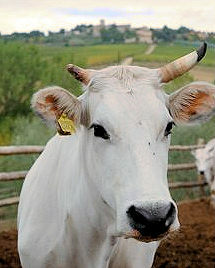 For example, biodynamics requires the use of special preparations including cow horn manure. This is made by burying cow horns filled with cow faeces in the soil for months. This is applied at the insignificant rate of one horn’s worth to a hectare. Here I have to quote Demeter who make the meaningless claim that, “the horns of ruminants have significance for the development of life forces.” Another preparation involves camomile flowers fermented in bovine intestine and applied at the utterly miniscule rate of about 30cm worth to 100 hectares, while oak bark matured in a single calf skull treats 300 hectares. 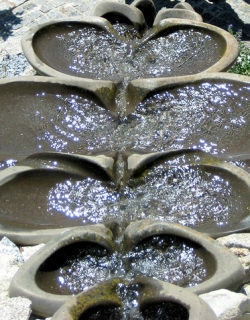 There is also a list of herbal ‘teas’ that have to be sprayed onto compost, and which will only work after being ‘dynamised’ by stirring for an hour in a special way (right, the dynamising fountain at Portuguese biodynamic producer, Afros). Again to quote Demeter, “produced in this special way, the preparations develop a strong yet subtle power whose effect may be compared to that of homeopathic remedies.” By my book, that is a clear statement that they don’t work – beyond the enormous power we human beings have for self-delusion. It’s well known that farmers (and that includes grape farmers) are a superstitious lot – after all they only have 40 chances to get it right in a typical lifelong career, and the vagaries of the weather can so easily destroy a whole year’s work. What are actually needed are proper double blind randomised experiments but it’s hard to see who would fund these – it’s against the spiritual philosophy of the biodynamic movement, and there’s little commercial interest, if any, in disproving this approach. So what of the alternatives? I firmly believe that we should be taking care of our vineyards and managing them as sustainably as possible. Viticulture is actually a rather unfriendly form of farming, especially if you look at some of the barren ‘green concrete’ that makes up conventionally managed vineyards all over the world. Particularly bad examples in my view are the irrigated vineyards of the Murray-Darling basin in Australia. This is the driest continent in earth and yet tax breaks have encouraged vineyard plantings without any thought for long term availability of water, or the massive problems of salinity. In fact the IPCC claims that globally 20% to 50% of irrigated land is affected by salinity. The obvious alternative for the responsible grower is to become as natural as possible and go organic. The idea is that only natural methods and products are used – no synthetic agrochemicals – and mechanical tillage rather than using herbicides. It also encourages sustainability for the long term, soil health and biological diversity. It’s generally viewed as more expensive than conventional viticulture because organic inputs and soil tillage require a lot more hand labour plus tractor time (and that has its own implications for soil compaction and fossil fuel use), while others claim it’s easily paid for by the savings on agrochemicals. It certainly makes a difference where you are – dry farmed grapes in Cyprus for instance require very little treatment anyway, whereas trying to grow organically in the damp UK climate is a major challenge. Organic farming still has to deal with the issue of permitted chemicals like copper sulphate causing soil toxicity, but as yet there’s no natural alternative. It’s worth noting that growing grapes organically is strictly controlled in the EU and you have to be certified to use this claim on any labels. In fact, In Europe this only applies to grape growing as negotiations over winemaking standards recently collapsed over the issue of permitted levels of sulphites for organic winemaking. Many growers don’t want to go as far as being certified organic, and take the half way house option of sustainable viticulture or integrated production. The idea is to be more responsible than the conventional approach of spraying routinely just in case (often according to manufacturers’ instructions, who of course are in the business of selling more products). 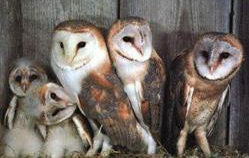 Sadly the problem for this approach is that there’s no single definition or recognised audit trail for being sustainable, though a number of local voluntary standards such as South Africa’s IPW (Integrated Production of Wine) and USA’s Lodi scheme have been established (above left, the Lodi scheme suggests the placement of owl boxes and raptor perches around vineyards to encourage owls and hawks into the area, which in turn control pests without the need for sprays). The best of these schemes take the approach of being as natural and responsible as possible: using habitat breaks to encourage beneficial insects and avian predators; pheromone traps and bacterial controls against insect pests; good vineyard management such as vigour control and open canopies for air circulation, and so on. However, it allows producers to use synthetic chemicals when necessary for problems that can’t be dealt with any other way. The best modern agrochemicals are often better than their natural counterparts as they’ve been designed to do a specific job then breakdown without leaving residues, and importantly, enabling the grower not to lose his or her livelihood for that year. To me, this approach makes lot of sense as a way forward, but it does need some global standards, and a much snappier title for marketing. So however many great names head down the biodynamic route, I remain to be convinced that most of it is anything more than myth, moonshine, and marketing ‘puff’ built on the back of some fundamentally responsible farming practices. Frequently, biodynamic producers are those who would be making great wine anyway (and often were before their conversion) because they have great terroirs and pay utter attention to the details of growing great quality grapes and making the best wine they can. Who needs anything more?